A sad little ceremony took place at Swindon works on 18 March 1960 when the 999th and last of the standard locomotives was formally named Evening Star. 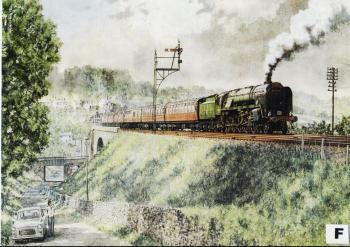 It was also the last steam engine ever to be built for British Railways. No. 92220 was a Class 9F 2- 10-0 heavy freight locomotive. The type was probably the best of all the standards but it had arrived too late, being introduced in 1954 only months before the modernisation plan was announced. Swindon recognised the importance of the locomotive by giving it the ultimate GWR accolade - a copper-capped chimney - and by turning it out in passenger green although as a freight engine it should have been black. The name Evening Star was chosen following a competition in the Western Region Staff Magazine. It was most appropriate, for the second locomotive to run on the GWR was called Morning Star. Now steam's long day was dying. Evening Star immediately acquired celebrity status. Allocated initially to Cardiff Canton depot, the shedmaster there eschewed its use on boring old freight trains and instead rostered it for his crack "Red Dragon" express to London. Enthusiastic crews rose to the occasion and soon Evening Star was putting in sparkling performances including, it was rumoured at the time, speeds up to 9Omph. Unfortunately the fun didn't last long, and Evening Star was quickly transferred to less exciting duties. Damaged in an accident, it was withdrawn in 1965, a mere five years old. Always on the official list for preservation it is now one of the National Railway Museum's working exhibits. The 9Fs proved well suited to passenger work and nowhere more so than on the steeply graded Somerset & Dorset line between Bath Green Park and Bournemouth West. Their considerable power obviated the need to double head the heavy summer only trains that brought thousands of holidaymakers from the still-industrial cities of the Midlands and North to the golden sands of the South Coast. But here again they were too late. The expresses were diverted away from the 'serene and delightful' at the end of the 1962 summer timetable leaving only the local trains. Four years later the whole line was closed. Here Evening Star steams majestically over the viaduct at Midford with the last down "Pines Express" from Manchester on 8 September 1962. Today Bath Green Park is a supermarket, Bournemouth West a car park, Midford a tangle of undergrowth and the couple in the car have it all their own way - traffic jams permitting. But Evening Star still shines!